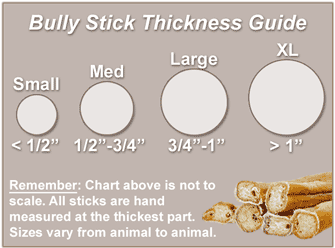 Our 5" Straight Bully Sticks for dogs feature a large thickness that's guaranteed to satisfy your pup's appetite to chew. Like the tale of Goldilocks and the Three Bears, this particular bully stick is "just right" for dogs of all sizes. Just like the rest of our bully sticks, these tough guys are completely all natural and free of any artificial flavors, preservatives or chemicals. Our team of doggie chefs know exactly what pups like, which is why they take the time to slow roasted our bully sticks in their own juices to lock in that tasty, savory beef flavor. The result is a delectable dog chew your pup won't be able to resist! 5" x 0.875" x 0.875"